With sixty-four pages full of stories about Adam Pig together with spreads on things to find and things to do, this attractively illustrated book had to be wrested from my preschool neighbour (and her mother!) so that I could write this review. The stories are an ideal length, full of sly humour and have a reassuring tone as Adam Pig copes with the excitements and some of the tribulations of family life faced by a pre-schooler (first day at nursery going to the park, going shopping). The 'things to do' pages may be infuriating as one is trying to explain why it isn't possible to do potato prints or 'make a green car to sit in' at bed time, but the ideas are generally easy to accomplish at other times and great fun especially when the completed things appear in a latter story linking the audience into the text in a delightful way. 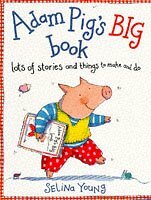 Particularly popular pages have been 'Adam Pig's house' and 'Help Adam Pig get dressed' leading to fun with labelling, discussing and making decisions based on the information given. This is an ideal book for under fives and wonderful value!